Presentation: 12 oz brown with a simple yet inviting label, purchase before date clearly marked. Appearance: Very dark brown with a clinging tan lace that seems to stay for a while. Smell: Mildly sweet in the nose with hints of charcoal, roasted malts and a touch of hops. Taste: Silky smooth with a nice medium bodied mouth feel. After the luscious mouth feel come the flavour which is quite malty ... light acidic twang from the roasted malts, a little dark roasted coffee flavour and an underlying toasted biscuit taste are balanced with a perfect combo of hop and roasted malt bitterness. The lingering after taste is of faded burnt sugar, drying grain and a slightly warming alcohol. A wonderful yet delicate hop character helps to round this brew also. Notes: Oh baby! There are good porters and then there are great porters ... this one goes down as a great one, no doubt! I've only been recently getting into "decent" beers - and have been favoring darker beers recently. Picked up a 6-pack of these to try over the weekend. I'm thoroughly impressed. Damn good beer. 16oz nitro draft presentation into a pint glass boasts a night black body resting beneath a persistent 1/4in blanket of cream colored head leaving erratic webbed lacing. Aroma is all roasty malt with no particular affinity, meaning neither coffee nor chocolate forward. Mouthfeel is creamy, smooth, full, and perfect with a dry finish. Overall one of the best. Poured dark with garnet red tinge. Limited temporary head, slight lacing. Slight smell is sweet malt. Taste is coffee with sweetish malt overtone and an almost indescribable green malt lingering aftertaste. Mouth is watery thin, mild carbonation. I am puzzled how some rave over this this beer. I have a very favorite porter and I like several others. Poured from the tap into a pint glass. The appearance is a dark brown color with a medium sized tan colored head. The aroma is a fantastic blend of roasted malt and cocoa. the flavor is rich and full and is a perfect match for the appearance and aroma. The taste is roasted malt with cocoa and coffee as an aftertaste. This is one of the best beers I have ever had. Had on tap. Very nice back chocolate coffee look. Taste was of chocolte and coffee. Really enjoyed this. Is one of the better coffee porters I have had. Will be drinking this again. This beer pours a dark black stoutish color. But not thick, somewhat watery.. though not as light as a newcastle. The aroma and initial taste is very earthy. The after taste is crisp and dry. Maybe I'll have to try it from the tap instead. I've had multiple bottles of this and I'm really suprised that some people adore this beer so much. I'd love for someone to reccomend a superb porter.. though i find it hard to trust peers that have an affinity for beers such as this. Hands down my favorite porter! 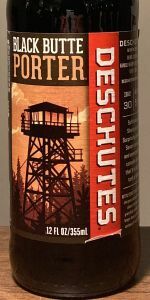 This Black Butte is a wonderful "reference" in the world of porters. Poured mildly aggressive, a beige head (two fingers) appears with bountiful amounts of lacing. to no grading while glass is tipped. It truly glows! Rather neutral after pouring, with a pleasant roasted malt sticking its comforting nose out. cinnamon rolled out nicely, with more chocolate essence to boot. of flavor hit my palate! The roasted malt is dominant (and delicious), followed by milk chocolate and mocha. diminishing and leaving room for nutmeg, and the cinnamon. Truly a fantastic treat! Filling, with an appropriate carbonation to match. Thick going down, although she sits nicely in the tummy. quantities of the spices and herbal undertones this delicious porter boasts. Outstanding porter! It makes no excuses and knows exactly what a porter should be (at least in my book)! Dark opaque color with creamy lined lacing. Smells of nuts, light coffee, cocoa, and dark malts. Taste is similar with stronger malt and some brown sugar. Goes down very easy with a rich but smooth body. Just a great porter. Look: Very dark, almost black. Smell: Like most porters I've encountered, smells of coffee and chocolate with a taste to match. Taste: Sweet and malty with a little hops. Overall: My go-to beer when I'm not sure what I want to drink. L: Had this beer on-tap at Rivermont Pizza, poured into a pint glass. Had a dark brown color and an opaque consistency. There was an inch of creamy, tan-colored, fairly long-lasting head. Fair lacing. S: An underwhelming aroma of roasted malt, chocolate, and a little coffee. T: Tasted of a little bit of chocolate / cocoa (not nearly enough), light coffee notes, a lot of roasted malt, light hops (mostly in the finish), and slight nutty quality. The problem here is that all of the ingredients seem not to be pushed far enough. The flavor has a bland, watery quality that's inescapable. F: A decent amount of carbonation with a mostly smooth finish. Medium-bodied. O: The high rating for this beer is somewhat mystifying. It's not the worst porter ever, but certainly not deserving of so much praise. There is nothing else that I want from a porter. Lots of coffee and chocolate on the nose. The taste is slightly oaky, with lots of coffee. Mouthfeel is moderate rather than creamy. Just a great representation of what a porter should be. Black Butte pours a dark deep brown color with a nice deep mahogany hue. I can just barely see through it. The head started off at about a finger-tall in a pint glass and receded to a hazy, dark tan film quickly. The lacy is fairly sticky and has the look of splashing water. The smell of the Black Butte is glorious. A perfect blend of roasted and chocolate malt aromas waft out of the glass. There is just a faint hint of nuttiness in there, as well. It is a deep and velvety aroma. Hmm, the the roasted malt flavors are the most prominent flavor at first taste, perhaps accentuated by a subtle pine hop taste. Also in the profile is a bit of burnt toast and coffee. There are a good amount of chocolate flavors in there, too, but the roasted malt tastes win. I wonder if the two flavors would marry better if this bottle aged more? The aftertaste of this brew is quite nice- a slightly chocolately, coffee-like acidic remnant. The mouthfeel is solid. A bit of acidic astrigency rides the sides of my palate and back of my tongue throughout the sip, while the mellower, medium body emerges in the middle of the sip. The finish has that little bit of acidic pucker that I mentioned previously. Overall, I think this beer hits the mark extremely well for the style. I generally tend to like slightly fuller, richer porters, but for a 5.2% a.b.v. porter, this is very well-crafted. This is a solid porter. Roasty malt, clean finish. Lighter body with moderate carbonation. Drinkable, sessionable beer. There are other porters I've liked more, usually with and added flavoring like coffee or roasted coconut. This beer is just a little too light on flavor and body for me. It obviously has a good following for a good reason as other reviews show. Just not my favorite. Wow, this was horrible on tap at our local Applebee's. I have had it in bottle and was much better. What happened? Usually bottle is not as good as tap. This beer tasted bland and I could not tell if there was any hops in it at all. Hmmm, bad batch? Too old? Too new? Didn't taste green just really bland. L: Deep dark brown with a thick foamy tan head. Great retention and very solid lacing. S: Roasted coffee, burnt grains, chocolate, vanilla, even some cherry, apricot and pine come through. T: Subtlety sweet fruit surprises you at first with a blast of cherry, then chocolate and brown sugar flood the palate, follow by roasted malt and finished perfectly with a slightly grass like hop finish. F: Light in body, moderate carbonation, great creamy finish. O: A very well balanced easy drinking porter. A: A very dark-brown beer with good clarity. The tan head is made of long lasting creamy bubbles. S: Medium-strong roast aromas with a medium bready malt character. supporting aromas of coffee, dark dried fruit and chocolate. T: A soft hit of flavors that starts of roasted and chocolaty with a moderatly-low toffee sweetness that develops into an off-dry, roasty finish developing. There is a medium-low hops bitterness and a low earth hops flavor. The balance is about even with maybe a bit more bitterness from the combination of roast and hops bitterness. Some dark dried fruit. M: A very creamy, medium bodied beer with a medium-strong level of carbonation. There is a very light roast astringency which is fine for the style. O: A roasty, complex beer with an excellent balance of flavors. The cream soft mouthfeel is a stand out amazing quality of this beer. Pours a very dark brown proper for the style - almost black, but illuminating a clearish ruby in the light. A rocky, fluffy light coffee-cream tan head forms and leaves behind sticky lacing as it falls to a thin covering. Smells of coffee and cinnamon dominate the nose - it's a sweet coffee smell, not bitter, with a slight astringent alcohol presence. The taste begins with a mild alcohol as well, which is swept away soon after by a kind of burnt brown sugar, coca-bean-husk flavor - followed immediately by a vague plum-skin fruitiness, almost Belgian in nature. It's an interesting flavored porter. The mouthfeel is a little watery (even for a porter), and has a bit of carbonation tang that enhances the slight bite of alcohol. This is an interesting porter; It's got a bit more bite than most, kind of jerking your taste buds around; It's got a lot of character, but the unfortunate part is that I've been having a very hard time deciding if I like its character or not. Half the flavors are tasty, the other half are astringent and tangy. It’s probably not the beer’s fault that I give it lower marks as I’m more used to the cranked-up stouts and imperial stouts. Poured a beautiful black without much head, but with lots of sticky lacing. Smelled of roasted coffee and chocolate, toasty malt, inviting but not too complex. Taste follows, with some bitterness from the roasted malt and slight hop bitterness. Feels slightly creamy, but less robust than I would like, thin at times. Extremely drinkable - goes down smooth. Pours a very dark color with ruby highlights shining around the edges topped by a thick foamy and kind of soapy tan head. Also saw some particles floating in there. Smells like toasted bread with a faint hint of bitter chocolate in the background. Taste is rich decadence of a nicely roasted beer. The bitter chocolate is in there somewhere cause I can find it on the back of the swallow. Mouth feel is actually pretty light and has a clean finish. Pours a very dark brown with one and a half fingers of tan head that leaves kindergartener's sponge painting lace as it recedes. Smells of cocoa powder, coffee grounds, roasted caramel malt and mild leafy hops. Tastes of more semi-sweet cocoa powder, creamy coffee, mildly sweet black licorice, caramel and soft hoppy bitterness. Feels fluffy and smooth. Medium bodied with creamy carbonation. Finishes dry. Verdict: Vigorously recommended. Very tasty and easy to drink. LOOK - Very dark - slight light penetration. Reddish/brown hue. SMELL - Some chocolate/coffee/toffee - dark roasted grains. TASTE - Slight hops - nice bite upfront. Chocolate and coffee hints. Quite dry and toasty. Gets even more dry as you go. OVERALL - A really good porter - I think of porters being a tad bit sweeter but this is really good. Poors a nice dark brown/black with a thin head. Very nutty sour milk smell with scents of coffee and chocolate. Taste is a nice bitter chocolate which you get with taste from start to finish. Very unique but good. Getting some hints of a barnyard with both the smell and taste which is not off putting. Almost some grain in the smell too. I enjoyed this one. Good job Deschutes.